Note: Most of the screen shots in this article were taken in Excel 2016. If you have a different version your view might be slightly different, but unless otherwise noted, the functionality is the same. On a worksheet, click the cell where you want to create a hyperlink. You can also select an object, such as a picture or an element in a chart, that you want to use to represent the hyperlink. On the Insert tab, in the Links group, click Hyperlink . You can also right-click the cell or graphic and then click Hyperlink on the shortcut menu, or you can press Ctrl+K. Under Link to, click Create New Document. In the Name of new document box, type a name for the new file. Tip: To specify a location other than the one shown under Full path, you can type the new location preceding the name in the Name of new document box, or you can click Change to select the location that you want and then click OK. Under When to edit, click Edit the new document later or Edit the new document now to specify when you want to open the new file for editing. In the Text to display box, type the text that you want to use to represent the hyperlink. To display helpful information when you rest the pointer on the hyperlink, click ScreenTip, type the text that you want in the ScreenTip text box, and then click OK.
You can also right-click the cell or object and then click Hyperlink on the shortcut menu, or you can press Ctrl+K. To select a file, click Current Folder, and then click the file that you want to link to. You can change the current folder by selecting a different folder in the Look in list. To select a web page, click Browsed Pages and then click the web page that you want to link to. To select a file that you recently used, click Recent Files, and then click the file that you want to link to. To enter the name and location of a known file or web page that you want to link to, type that information in the Address box. To locate a web page, click Browse the Web , open the web page that you want to link to, and then switch back to Excel without closing your browser. If you want to create a hyperlink to a specific location in the file or on the web page, click Bookmark, and then double-click the bookmark that you want. Note: The file or web page that you are linking to must have a bookmark. To link to a location in the current workbook or another workbook, you can either define a name for the destination cells or use a cell reference. To use a name, you must name the destination cells in the destination workbook. Click the Name box at the left end of the formula bar . In the Name box, type the name for the cells, and then press Enter. Note: Names can't contain spaces and must begin with a letter. On a worksheet of the source workbook, click the cell where you want to create a hyperlink. To link to a location in your current workbook, click Place in This Document. To link to a location in another workbook, click Existing File or Web Page, locate and select the workbook that you want to link to, and then click Bookmark. In the Or select a place in this document box, under Cell Reference, click the worksheet that you want to link to, type the cell reference in the Type in the cell reference box, and then click OK. In the list under Defined Names, click the name that represents the cells that you want to link to, and then click OK.
You can use the HYPERLINK function to create a hyperlink that opens a document that is stored on a network server, an intranet, or the Internet. When you click the cell that contains the HYPERLINK function, Excel opens the file that is stored at the location of the link. Link_location is the path and file name to the document to be opened as text. Link_location can refer to a place in a document — such as a specific cell or named range in an Excel worksheet or workbook, or to a bookmark in a Microsoft Word document. The path can be to a file stored on a hard disk drive, or the path can be a universal naming convention (UNC) path on a server (in Microsoft Excel for Windows) or a Uniform Resource Locator (URL) path on the Internet or an intranet. Link_location can be a text string enclosed in quotation marks or a cell that contains the link as a text string. If the jump specified in link_location does not exist or can't be navigated, an error appears when you click the cell. Friendly_name is the jump text or numeric value that is displayed in the cell. Friendly_name is displayed in blue and is underlined. If friendly_name is omitted, the cell displays the link_location as the jump text. To jump to a different sheet in the same workbook, change the name of the sheet in the link. In the previous example, to create a link to cell E56 on the September sheet, change the word "June" to "September." When you click a hyperlink to an email address, your email program automatically starts and creates an email message with the correct address in the To box, provided that you have an email program installed. In the E-mail address box, type the email address that you want. Note: Some web browsers and email programs may not recognize the subject line. You can also create a hyperlink to an email address in a cell by typing the address directly in the cell. For example, a hyperlink is created automatically when you type an email address, such as someone@example.com. You can insert one or more external reference (also called links) from a workbook to another workbook that is located on your intranet or on the Internet. The workbook must not be saved as an HTML file. Open the source workbook and select the cell or cell range that you want to copy. Switch to the worksheet that you want to place the information in, and then click the cell where you want the information to appear. On the Home tab, in the Clipboard group, click Paste Special. Excel creates an external reference link for the cell or each cell in the cell range. Click the cell that contains the hyperlink, hold the mouse button until the pointer becomes a cross , and then release the mouse button. Use the arrow keys to select the cell that contains the hyperlink. If the hyperlink is represented by a graphic, hold down Ctrl, and then click the graphic. You can change an existing hyperlink in your workbook by changing its destination, its appearance, or the text or graphic that is used to represent it. Select the cell or graphic that contains the hyperlink that you want to change. Tip: To select a cell that contains a hyperlink without going to the hyperlink destination, click the cell and hold the mouse button until the pointer becomes a cross , and then release the mouse button. You can also use the arrow keys to select the cell. To select a graphic, hold down Ctrl and click the graphic. You can also right-click the cell or graphic and then click Edit Hyperlink on the shortcut menu, or you can press Ctrl+K. In the Edit Hyperlink dialog box, make the changes that you want. Note: If the hyperlink was created by using the HYPERLINK worksheet function, you must edit the formula to change the destination. Select the cell that contains the hyperlink, and then click the formula bar to edit the formula. You can change the appearance of all hyperlink text in the current workbook by changing the cell style for hyperlinks. To change the appearance of hyperlinks that have not been clicked to go to their destinations, right-click Hyperlink, and then click Modify. To change the appearance of hyperlinks that have been clicked to go to their destinations, right-click Followed Hyperlink, and then click Modify. Note: The Hyperlink cell style is available only when the workbook contains a hyperlink. The Followed Hyperlink cell style is available only when the workbook contains a hyperlink that has been clicked. In the Style dialog box, click Format. On the Font tab and Fill tab, select the formatting options that you want, and then click OK. The options that you select in the Format Cells dialog box appear as selected under Style includes in the Style dialog box. You can clear the check boxes for any options that you don't want to apply. Changes that you make to the Hyperlink and Followed Hyperlink cell styles apply to all hyperlinks in the current workbook. You can't change the appearance of individual hyperlinks. To change the hyperlink text, click in the formula bar, and then edit the text. To change the format of a graphic, right-click it, and then click the option that you need to change its format. To change text in a graphic, double-click the selected graphic, and then make the changes that you want. To change the graphic that represents the hyperlink, insert a new graphic, make it a hyperlink with the same destination, and then delete the old graphic and hyperlink. Right-click the hyperlink that you want to copy or move, and then click Copy or Cut on the shortcut menu. Right-click the cell that you want to copy or move the hyperlink to, and then click Paste on the shortcut menu. By default, unspecified paths to hyperlink destination files are relative to the location of the active workbook. Use this procedure when you want to set a different default path. Each time that you create a hyperlink to a file in that location, you only have to specify the file name, not the path, in the Insert Hyperlink dialog box. In the Summary tab, in the Hyperlink base text box, type the path that you want to use. Note: You can override the hyperlink base address by using the full, or absolute, address for the hyperlink in the Insert Hyperlink dialog box. 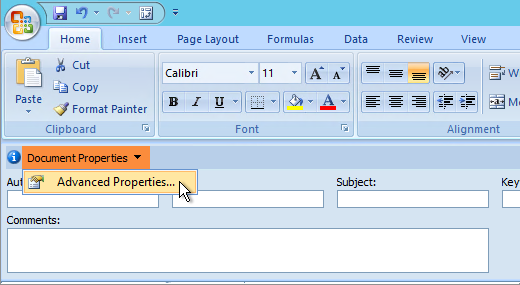 Click the Microsoft Office Button , click Prepare, and then click Properties. 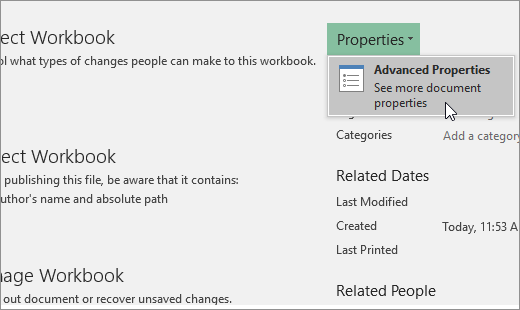 In the Document Information Panel, click Properties, and then click Advanced Properties. In the Hyperlink base box, type the path that you want to use. To delete a hyperlink and the text that represents it, right-click the cell that contains the hyperlink, and then click Clear Contents on the shortcut menu. To delete a hyperlink and the graphic that represents it, hold down Ctrl and click the graphic, and then press Delete. To turn off a single hyperlink, right-click the hyperlink, and then click Remove Hyperlink on the shortcut menu. In a blank cell, type the number 1. Right-click the cell, and then click Copy on the shortcut menu. Hold down Ctrl and select each hyperlink that you want to turn off. Tip: To select a cell that has a hyperlink in it without going to the hyperlink destination, click the cell and hold the mouse button until the pointer becomes a cross , and then release the mouse button. Under Operation, click Multiply, and then click OK. Under Good, Bad, and Neutral, select Normal. When a site user clicks the hyperlink, the destination is shown in a Web browser, opened, or run, depending on the type of destination. For example, a hyperlink to a page shows the page in the web browser, and a hyperlink to an AVI file opens the file in a media player. When you point to text or a picture that contains a hyperlink, the pointer becomes a hand , indicating that the text or picture is something that you can click. An absolute URL contains a full address, including the protocol, the Web server, and the path and file name. A relative URL has one or more missing parts. The missing information is taken from the page that contains the URL. For example, if the protocol and web server are missing, the web browser uses the protocol and domain, such as .com, .org, or .edu, of the current page. It is common for pages on the web to use relative URLs that contain only a partial path and file name. If the files are moved to another server, any hyperlinks will continue to work as long as the relative positions of the pages remain unchanged. For example, a hyperlink on Products.htm points to a page named apple.htm in a folder named Food; if both pages are moved to a folder named Food on a different server, the URL in the hyperlink will still be correct. In an Excel workbook, unspecified paths to hyperlink destination files are by default relative to the location of the active workbook. You can set a different base address to use by default so that each time that you create a hyperlink to a file in that location, you only have to specify the file name, not the path, in the Insert Hyperlink dialog box. You can also right-click the cell and then click Hyperlink on the shortcut menu, or you can press Ctrl+K. Under Display Text box, type the text that you want to use to represent the hyperlink. Under URL, type the complete Uniform Resource Locator (URL) of the webpage you want to link to. To link to a location in the current workbook, you can either define a name for the destination cells or use a cell reference. To use a name, you must name the destination cells in the workbook. On the Name Box box at the left end of the formula bar , type the name for the cells, and then press Enter. On the worksheet, click the cell where you want to create a hyperlink. Under Place in this document box, enter the defined name or cell reference. Under E-mail address, type the email address that you want. You can use the HYPERLINK function to create a hyperlink to a URL. Note: The Link_location can be a text string enclosed in quotation marks or a reference to a cell that contains the link as a text string. Select a cell by clicking it when the pointer is an arrow. You can change an existing hyperlink in your workbook by changing its destination, its appearance, or the text that is used to represent it. Select the cell that contains the hyperlink that you want to change. Tip: To select a hyperlink without activating the link to its destination, use the arrow keys to select the cell that contains the hyperlink. Right-click the cell and then click Delete Hyperlink.